Investigators involved in the seizure of material from loyalist blogger Jamie Bryson knew nothing about his journalistic credentials, the High Court heard on Wednesday. Counsel for the police and a body which regulates the security industry insisted the probe was only focused on any alleged unlicensed supply of door staff. Mr Bryson is challenging the legality of warrants obtained from a lay magistrate to search residential and business premises in Co Down last August. The commentator was arrested at the time but later released without charge. PSNI officers obtained and executed the warrants on behalf of the Security Industry Authority (SIA) as part of that organisation’s ongoing inquiries into any suspected illegal supply of bouncers. Documents, laptops and an iPad were reportedly seized in the raids. Mr Bryson, who denies any wrongdoing, has issued judicial review proceedings in a bid to have the search warrants declared unlawful. His lawyers argued that officers had no power to take journalistic and other legally privileged material during the operation. A County Court judge, rather than a lay magistrate, must give the go-ahead to seize such documents, they contended. But Tony McGleenan QC, for the PSNI and SIA, responded: “They were unaware of his credentials as a journalist, unaware of his affiliation to any trade union or association. Attempts have since been made to return any such documents, according to counsel. The court heard how the SIA wrote to Mr Bryson last summer requesting information about JJ Security Services Ltd, a company in which he is a named director. 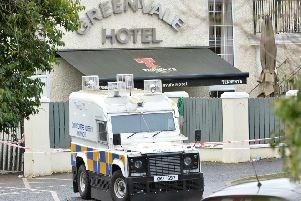 It formed part of an investigation into door staff operating in the north Down area. In his reply Mr Bryson stressed JJ Security Services has never traded and does not hold any relevant information. Mr McGleenan contended, however, that he had failed to actively address the issues put to him. “He answered the key question by saying his company never traded, didn’t exist in that regard and there’s no material to be obtained,” the barrister said. Much of the equipment and documents seized remains unexamined after Mr Bryson secured an injunction pending the outcome of his legal challenge. His barrister emphasised that he had emailed the SIA making clear a willingness to “provide as much assistance as I possible can”. Claiming the search warrant applications should not have been dealt with by a lay magistrate, Ronan Lavery QC also disputed assertions made about his client’s status. “Anybody who would be investigating Mr Bryson for nearly a year would know that he’s a journalist and well-known blogger,” he said. Adjourning the hearing, Mr Justice McCloskey and Mr Justice McAlinden requested more information from both sides before ruling on whether they should grant leave to seek a judicial review.